9 Series - Morris Industries Ltd.Morris Industries Ltd. The tank shape is designed to increase filling efficiencies and operator safety. Silver metallic paint and clear coat provides outstanding toughness and resistance. The grated stairway located at the rear of the air cart is accessed from the auger side. A retractable section provides a low step height when in use then slides up and locks it out of the way. The sliding section has 2 larger gas cylinders that help lift and hold the stairs until locked in position. The left side auger/conveyor provides easier access when filling. A new 6-function wireless remote has been included with the optional hydraulic assist to reduce operator fatigue. The walkway is positioned to allow an operator more room to work and avoid dust when filling the tanks. Grating and handrails around the walkway platform offer excellent protection for a more secure and safe work area. Morris introduces stainless steel distribution pipes and meter bodies for higher resistance to corrosion. This patented design maintains a smooth horizontal flow of products as it leaves the primary runs to the divide into each secondary run. This precise and efficient system ensures that germination, growth and vigor are protected. An industrial piston-type hydraulic motor powers the 17” diameter forward curved fan. Large hydraulic lines decrease flow restriction for less heat build up under higher fan speeds. A dual fan option is available for large width seeding tools. The time-proven spiral fluted metering wheel is the center of the metering system. The spiral flute provides a continuous flow of product into the air stream. The meter body on the 9800 air cart model has been widened to accommodate up to 10 metering wheels to utilize larger seeding units. Morris Input Control Technology (ICT) and the Topcon X35 monitor provides seed and fertilizer conservation, overlap control and ease of use. The ICT system uses a unique and simple drive system to engage, or disengage the individual metering wheels to stop the product flow instantly. Depending on the drill size, Input Control Technology is capable of controlling up to 10 sections. Morris offers the Topcon AGI-4 as the primary receiver for our ICT units. The AGI-4 allows use of the Omni-STAR subscription service that can decode DGPS (differential correction signals), which corrects any map drift and provides a more accurate GPS signal. *Morris Industries highly recommends the use of subscription based correction services for optimal ICT performance. Quick-change sprockets provide simple, reliable adjustments between crops and posi-drive transmission uses a positive lock on all drive sprockets to deliver smooth and reliable metering. Seed and fertilizer rate charts have been added to the tanks to allow for a quick reference when starting calibrations of different products. Fan speed, shaft rotation, bin levels, acres seeded and other critical data are available with the standard monitor system. 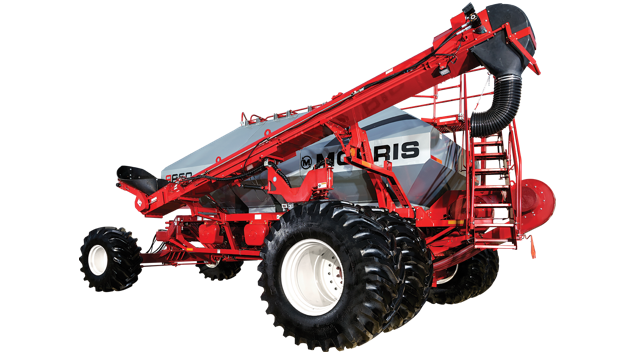 The Morris variable rate options is quick and responsive for precise on the go rate changes. The VRT option features Topcon’s industry-leading X35 Console with an intuitive multiview interface.